Google should be your best friend in this journey. It gets incredibly bothersome to have the same trans 101 conversation over and over again with a plethora of cis people so having a basic understanding of some 101 things (like definitions) is super nice. Do not immediately gender someone based on artificial physical traits. The person may have stereotypical feminine or masculine traits but until you know for sure, shy away from immediately guessing their gender and using potentially wrong pronouns. I like saying friends or folks to a group of people if I don’t all know how they identify. Use the right pronouns and names once you know. If you make a mistake, fix it yourself and try not to do it again. Everyone makes mistakes but if you constantly misgender someone, it gets incredibly difficult to be around you. Some trans people aren’t out to every single person in their life, while some trans people are. There are a plethora of experiences in the trans community and each individual person is in a different stage of coming out, transitioning, or anything else. Talk to the individual about how comfortable or out they might be. Our stories have been almost constantly told without us (there are exceptions, like Janet Mocks’ book Redefining Realness) so we don’t need other people in our lives telling our own stories for us. There’s a difference between talking about issues facing the trans community and speaking for/over us. If possible, donate to trans organizations or individuals that might be struggling. So this ended up being a hell of a lot longer than I originally anticipated. But! 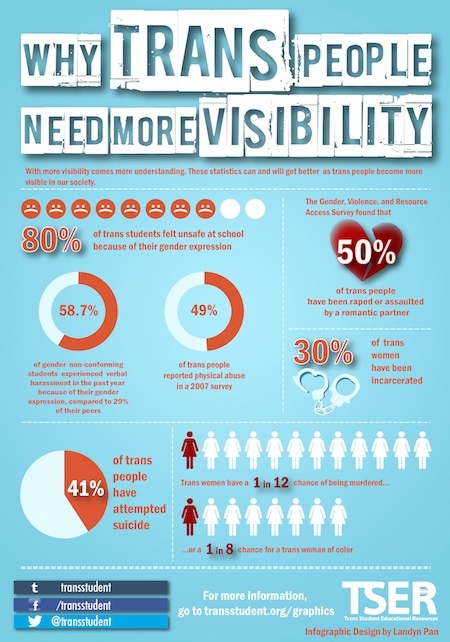 These are just some of the many resources available for and about the trans community. And simply raising awareness isn’t enough to fix all the issues and struggles faces by trans individuals – Elisa Resce wrote very recently that in Australia, awareness isn’t enough and that we need policy reform to really help. And it’s important to remember that there are really positive stories out there other than the negative aspects that are highlighted here and in the media. WeHappyTrans, I Am: Trans People Speak, and the Twitter hashtag #RealLifeTransAdult all highlight some amazing and wonderful stories of trans individuals. Thank-you so much for this. An awesome resource! I’ll be sharing it!